Toshiba this week launched its new lineup of high-reliability hard drives for NAS units. The drives offer up to 8 TB of capacity and are based on enterprise-grade platforms. According to Toshiba's specifications, these and are among the highest-performing 3.5” HDDs on the planet. 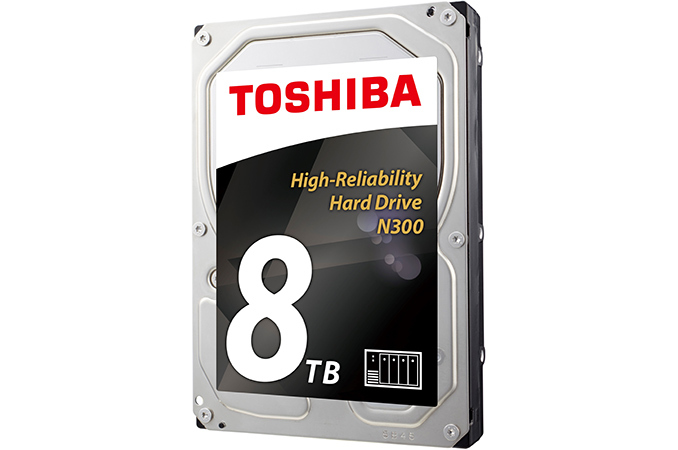 The Toshiba N300 family of hard drives consists of three models with 4 TB, 6 TB and 8 TB capacities, a SATA 6 Gb/s interface, a 7200 RPM spindle speed and a 128 MB buffer. All three HDDs are based on a high-reliability platform that attaches a spindle to both sides of a drive (to curb system-induced vibration), has rotational vibration (RV) sensors, shock sensors and temperature sensors as well as supporting error recovery features. The new HDDs are designed for 24/7 availability, 1 million hours MTBF and have a 180 TB/year workload rating, which is in line with other hard drives for NAS devices with 8 bays and is considerably higher than the workload rating of typical desktop HDDs. Toshiba’s N300 HDDs resemble the company’s MN05-series drives introduced in February (which are also designed for enterprise-class NASes) and are likely based on the same PMR platters (perpendicular magnetic recording) with up to 1.33 TB capacity per platter (the 8 TB version features six of such discs). In addition to the same platters, the N300 drives also have the same power consumption as the MN05 HDDs, but offer slightly different performance, according to the specifications. As for performance, Toshiba claims up to a 240 MB/s sustained data transfer rate as well as a 4.17 ms average latency time for the N300 8 TB model, which is slower compared to the MN05 8 TB. Meanwhile, since the 6 TB and 4 TB N300 HDDs use different platters, their performance is a bit lower (due to the lower areal density). Toshiba is already shipping its N300 HDDs to partners and the drives are expected to be available in stores this month. Exact prices will depend on the retailer, but keep in mind that although the N300 are aimed at consumers, they are based on advanced platforms and support numerous enterprise-grade features. "Toshiba claims up to a 240 MB/s sustained data transfer rate as well as a 4.17 ms average latency time for the N300 8 TB model, which is slower compared to the MN05 8 TB." What? Data transfer is faster, latency is identical. Again, why do you report the average latency?, because it's just another way of reporting the spindle speed. It just makes you look like you don't understand what it is.